Do you SEE that?! It’s a savory sweet potato casserole! My brain might be exploding. So – I love love love sweet potato casserole. 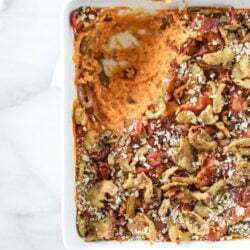 It’s a fairly recent love, like about four years ago when I first created this lightened up sweet potato casserole is exactly when I fell hard. Both of my grandmothers used to make a (very different) version of sweet potatoes for Thanksgiving and I totally wasn’t into it. I WAS MISSING SO MUCH! Even though I enjoy the classic dish, there are the very, very, very few times that it’s almost just a leeeettle too sweet for me. For instance, sometimes for Thanksgiving dinner I want it on a separate plate – or on my plate after I’ve finished the first plate – because it practically tastes like dessert. You totally know what I mean. Right? The other thing is that while Eddie adores sweet potatoes (we probably eat them two or three days a week), he has zero desire to eat them when topped with sugar and pecans. And even marshmallow. He doesn’t even like the marshmallow! The first time he told me that, I almost fell over. Hello, who WOULDN’T want toasty, melty marshmallows all over their sweet potatoes? Here I am. Solving the problem! I’m partnering with French’s today because there is such a thing as Crispy Fried Jalapeños. Jalapeños! You know, like the crispy onions?! I’ve died and gone to heaven, you guys. These are out of this world. I thought that I loved the crispy onions but my life is forever changed right now. It’s almost like these crispy jalapeños are ever so sliiiightly sweet too, but first you have the crunch and then you have the heat. And maybe just a touch of sweetness. They are SO good. eeeeep! Basically I’m never not doing that again. Lots of garlic and salt and pepper too. The potatoes are still inherently sweet though, of course, so I knew I had to go all out on the toppings. Crunchy bacon, caramelized shallots, and big old handfuls of the Crispy Fried Jalapeños. It has texture. Loads of flavor. The ever-so-perfect balance of the sweet and savory. It might not be the most photogenic dish, but t is your taste buds’ dream. I promise. Place the sweet potatoes in a saucepan and cover with cold water. Bring the mixture to a boil and boil for 20 minutes, until the potatoes are fork tender. Drain the potatoes and place them in a large bowl. While the potatoes are boiling, heat a large skillet over medium-low heat and add the bacon. Cook, stirring often, until the bacon is crispy and the fat is rendered. Once crispy, remove the bacon with a slotted spoon and place it on a paper-towel lined plate to drain excess grease. Reserve 2 tablespoons for the potatoes and leave the rest of the grease in the skillet. Add the shallots to the skillet with a sprinkle of salt and the brown sugar. Cooking over low heat, stirring often, until golden and caramel, about 10 to 15 minutes. Stir in the garlic. Take two tablespoons of the bacon grease and add it to the potatoes. Add the butter, half and half, salt and pepper and blend using a hand mixer (or a stand mixer!) or mash with a potato masher until totally smooth. Spoon the sweet potatoes into an 8×8 inch baking dish. Top with the caramelized shallots and crispy bacon. Sprinkle on the panko. Place the dish in the oven and bake for 30 minutes. Remove and sprinkle with the French’s® Crispy Fried Jalapeños. Place the dish back in the oven for 10 minutes. Now this needs to go in a grilled cheese. Omg! What! Crispy fried jalapeños! I need to give this a try now! This savory sweet potato casserole sounds delicious. I love that it has savory notes to it so that it wouldn’t be too sweet. This looks and sounds amazing! I will definitely be making this for Thanksgiving! Oh wow! Those fried jalepenos and bacon on top just set this off with what sounds like an amazing combination of flavor! I love it! And bacon and sweet potatoes and crunchy jalapeños? I die. I now have to rework our menu. At what point do you cook/add the garlic? Do you cook with the shallots, or add to the potatoes? Also, if I am making this ahead of time, should I bake it up until it’s time for it to go in the oven, and just take and bake at my Thanksgiving destination? OHHHHHH MYYYYY. I’m totally obsessed with sweet potato this season (and perhaps forever…) this looks delectable! Adding this to my Thanksgiving menu. My family won’t know what to think when I replace my normal streusel topped sweet potato casserole!! One question though-I don’t see the brown sugar in the ingredient list, I’m assuming it’s just a bit??? Thank you. Do you happen to know what grocery store carries these? I looked at Cub Foods but no luck. I was looking by the Frenchs Fried Onions in the Thanksgiving display with no avail. My family is in the minority and, dare I say, not a single one of us likes the traditional sweet potato/ marshmallow confection/side dish. But since we grow the most beautiful sweet potatoes and like to eat them other ways, they’re still a staple on our Thanksgiving table. I’m not looking any further for this year’s recipe. How far in advance can this be prepared without any pre baking until the hour before our meal? Thank you. Berger, when he breaks up with Carrie. Where does the garlic go in? Did I miss that? Love the idea of this recipe! !